The Right Brain: Send That Engineer Up Here Or I'll Sue! Send That Engineer Up Here Or I'll Sue! 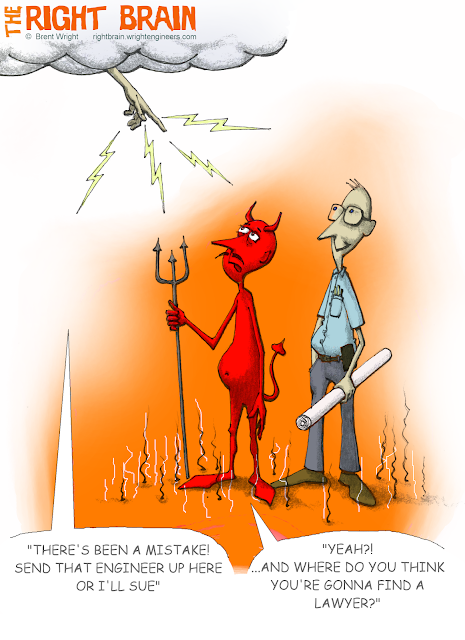 The story goes that an engineer dies and is mistakenly sent to hell. Before long, he's dissatisfied with the poor conditions in hell and he goes to work making improvements. Soon hell no longer feels much like hell and the engineer has become very popular with the residents. One day God calls down to Satan to see how things are going in hell. "Everything's great!" Satan replies. "We have air conditioning and cable TV and flushing toilets. Who knows what my engineer will come up with next." "You've got an engineer?!" says God. "There's been a mistake! Send him up here immediately or I'll sue!" Satan smirks and replies, "And where do you think you're gonna find a lawyer?"